Summary FANTASTIC BEASTS AND WHERE TO FIND THEM is a fantasy adventure drama, set in 1920s New York, in which a wizard becomes involved in a battle against dark forces that threaten the city. 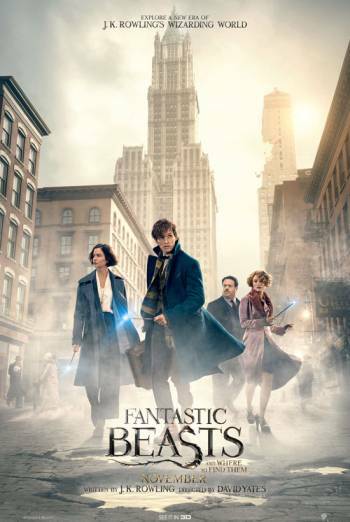 FANTASTIC BEASTS AND WHERE TO FIND THEM is a fantasy adventure film, set in 1920s New York, in which a wizard becomes involved in a battle against dark forces that threaten the city. There are scenes in which dark forces threaten or kill human characters, some of which include brief focus on dead humans' faces. In one scene, a woman sentenced to death is shown visions of her past to try to force her to die. There are also some intense scenes in which dark forces threaten and destroy parts of the city; however, these are neither frequent nor sustained. There are some verbal references to physical child abuse and corporal punishment. The film also contains some mild bad language (eg 'bugger', 'hell'). If you would like to receive regular mailings about BBFC resources, workshops, advance information about events and recent classifications or decisions which we think you may be interested in please complete the form below. Industry Sign up for news on Industry Services. Education Sign up for news on Education events for students. General Public Sign up for news for the general public.